The IT teacher Sundiata Lake and Remedial/Special Ed. teacher Helen Hassell at SHS on Saba have introduced a new software of communication for this school year 2018-2019. The software uses an app by AssistiveWare called Proloquo2go. It is for students with Autism, Down Syndrome, and any other special need students that have difficulties communicating. With the approval of Principal Diane Wilson, the school board and the support of the parent, the new app, which is installed on an I-pad will give the students an additional tool to interact and communicate with their teachers and fellow students and at the same time the student will learn a lot. Once the app has reached positive results, other students will also benefit from this app. 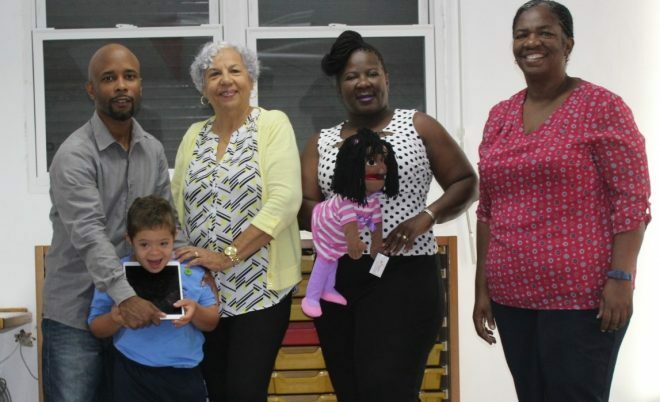 “The app will truly be successful with the support, guidance, and patience of all parties,” said Sundiata Lake. The SHS is constantly looking for opportunities to further educate, enhance, and improve the lives of every student also the student with special needs. Return to Happiness – A Post Disaster Psychosocial Recovery Program for Children came to Saba. The workshop was given by Suzette Moses Burton, Swaitsha Antoine, Tara Leonard-Emanuel, UNICEF representatives. All the teachers were trained how to support their students when they return to school after a minor or major disaster. The disaster can be hurricane, loss of a friend or family member etc. The teachers learned through practical exercises how to handle and deal with certain situations. The school received a few Toolkits with several supplies and activities that can be used with the students. “It was a great success,” said Jarmila Berkel, the Guidance counselor. Conscious Discipline is a comprehensive social- emotional and classroom management program that uses everyday life events to reach children and adults. SHS also implemented several CD techniques in the classrooms. This program allows us as educators to teach by example. The students are intrinsically motivated to be helpful, responsible, and caring citizens. “The students have to feel safe in the school environment,” said teacher Tevonille Dunchi, one of the CD team members. Dr. Becky Bailey is the founder of Conscious Discipline. Principal Diane Wilson and President of the school board, Ms. Mary Anastacia Simmons have once again topped with its First Week of Teacher’s Professional Development. Mathematical Specialist Ms. Laura Gifford from Houghton Mifflin Harcourt- Math in Focus- Singapore Math by Cavendish has visited the school to train, re-train and to give updates on methodology, concept development, and transitioning from one grade into another. She also focused on Math in Focus: Work Station Ideas, Numeracy/ Fact Fluency, Enrichment Exercises, Mathematical Games, Virtual Manipulatives, Problem Solving, Technology, and Differentiation. She encouraged the teachers to observe if the students had acquired the pre-requisite skills for an idea/concept sufficiently from the previous grade, and if not, to return to the previous level, let them learn the skill and only then move on, for this will provide a smooth flow into the new areas. Math in Focus- Singapore Math can be used with the Student’s Books, Student’s Workbooks, and also on the E-Boards with the same exercises, enrichment and transitions. Once again, SHS is striving for its staff and students to be nothing but the best! Sacred Heart school supports National Down Syndrome Awareness Month. School starts: 7:30am | ends:1pm. Buses pick-up: 6:30am - 7:00am. K1 & K2 start: 7:45 - 8:00am | end:12:30pm. Extra classes (3x a week): starts:1:15pm til 2:pm. © Copyright - Saba Sacred Heart Primary. All rights reserved.